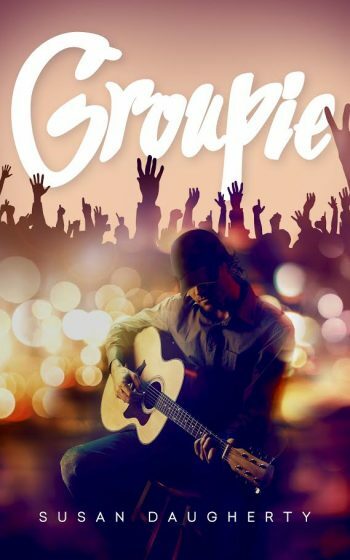 Welcome to the blog tour for GROUPIE, the first book in the adult contemporary romance series, Groupie, by Susan Daugherty. See below for information on the book, buy links, an exclusive excerpt, and details on her giveaway. *Please note: Groupie is Volume One in a two-part series. I saw Charlie gaze over my shoulder, looking toward Jackson’s bus, and I turned to see him slowly moving toward the group on his crutches. He was wearing red plaid pajama pants that hung low on his hips and a tight, white, ribbed tank. That was all. His hair was tousled from the pillow, a shadow of a beard traced around his chin, and his blue eyes were electric. I knew I stared but couldn’t stop. This was the best look for him yet, and all he’d done was wake up. 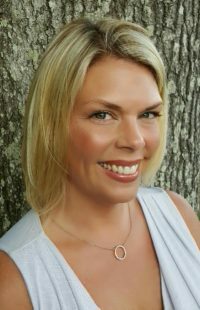 I felt Ashley nudge me into alertness as Jackson neared, and I cleared my throat and said, “Nice of you to get out of bed for us, Mr. Morgan.” I felt silly for taking so much time to get ready when he evidently did the opposite. If only I looked like that first thing in the morning. I gave an exaggerated eye roll and decided to get my bags as they talked. I began to lug them over and realized I had no idea where to put them, since we wouldn’t convene with the girls’ bus until Chattanooga. I caught Jackson’s eye, as I stood awkwardly with my bags between the two buses, and he limped over to me. “Oh, no, I can get them. I just wasn’t sure where to put them until we meet up with the girls’ bus,” I explained. He frowned and gave me a puzzled look. “Why does that matter?” he asked as he waved to Andy, who quickly grabbed bags. His eyes got big, and then he smothered a laugh as he said, “No, Lex, you’re stuck with me. On my bus, the whole time, no escape.” The look of shock on my face must have alarmed him because he held up his hands to plead and rushed on, saying, “Look, it makes sense. My coach is the nicest by far. It has the most room for your equipment, we can do treatments anytime we want, and besides, the girls’ bunks are full. The plan was always for you to join the black bus. I didn’t know you thought otherwise. Did someone say that to you?” He was incredulous. “Um, they’ll think you’re the farthest thing from a groupie ever to walk the face of this earth. Seriously, it will be much more convenient. Remember, Blevins came by to approve of your accommodations? She thinks it’ll be fine.” He said it so matter of fact that I was speechless. She pulled me toward the bus, and I saw Jack shoot her a grateful look as I numbly followed her inside. She gaped and gushed as she inspected every inch, while I sank onto the couch. She knelt in front of me and shook my shoulders. “Please, don’t tell me you’re really upset about having to share quarters with a handsome rock star that treats you like gold. Please,” she begged as if trying to decide if I were truly insane. I shook off my numb stare for an anxious expression. I told her the truth, “It’s not that, Ash. It’s just…did you see him? If I have to look at that every morning when he gets up—ugh! I’ve tried so hard to stay professional, but every girl has a breaking point!” I buried my face in my hands. “You better keep me posted with daily text and calls, or I’ll be dying of suspense,” she warned me. I gave him an appreciative smile and he relaxed and smiled back. “Well, we’re taking off in just a minute, so I’ll see you soon. Nice to meet you, Ashley,” he said and they waved goodbye when he exited. Ashley and I hugged and said, “Love you. Mean it,” at the same time, making us crack up as we walked to her car. She told everyone to take good care of me before she left. Tears stung my eyes, but I blinked them back. Jackson headed onto the black coach as the others loaded into the gray one, and the drivers climbed into the cabs. Left as the last one outside, I braced myself to enter my new home with my ridiculously hot new roommate.